Central Railway stations, here we come! After a year-long hiatus, we are back with a bang at Central Railway stations and this time with bigger and better performances. 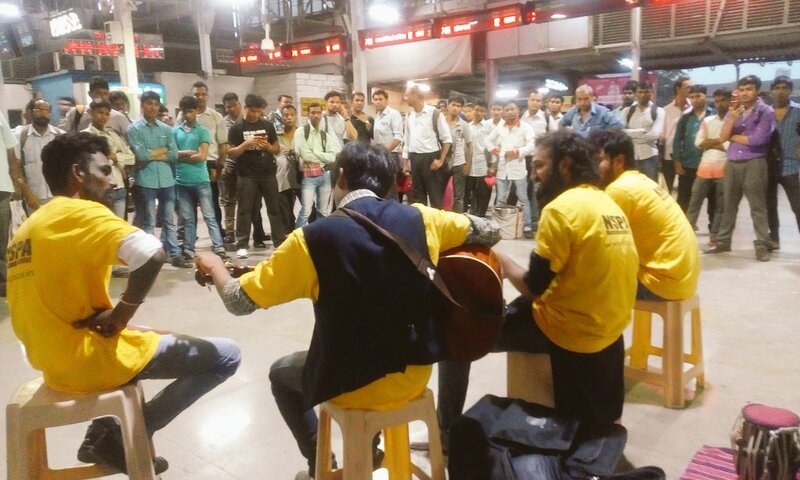 This Tuesday, we held our debut session at Dadar station, from 5-8 pm. What an experience it was, the response was overwhelming! All three performances held at this bustling, over-crowded station enjoyed much applause and adulation. 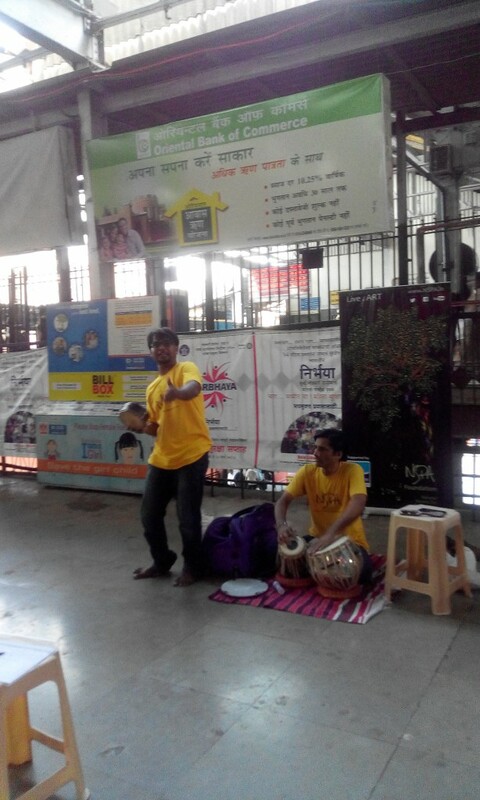 Commuters were quite surprised to find these wonderful artists in their midst, performing for free! The reactions of the commuters were quite interesting and almost always followed the same trajectory- first of suspicion and confusion then of mild interest, then a more pronounced interest that compelled them to gather around our artists and then of utter and absolute enjoyment that manifest in the form of cheers and applause. Once gathered around our artists, most couldn’t help but get involved in the performance. Some chose to sing along, some pulled out their gadgets and began clicking photographs or shooting videos for a more lasting memory, and a select few even shook a leg! The atmosphere was charged with excitement and happiness seemed contagious in this vicinity. It was as if a happy smile, once sported on a face, magically moved around, perching itself on every face in the surrounding! Another thing that struck us was the expressions on people’s faces as they listened to powerful folk and Sufi numbers. Like a blank canvas that gradually gives life and form to an artist’s innermost feelings, faces around us seemed to morph into pictures of grief, joy, pain, pride and a whole spectrum of emotions that we could see but could not comprehend. One really can’t explain what goes on in a person’s heart and mind when listening to music! The expressions are there for the world to see and yet, no one can fathom the reasons and emotions behind these expressions. As for our artists, they had a swell time performing for such an appreciative audience. Some went out of their way to involve the audience by asking them to sing along or clap their hands to the beat. We even had a few commuters ask us about our artists, about the work we do while some expressed a desire to join us! On the whole, it was a wonderful experience, one that has made us thirsty for more such opportunities. We really look forward to our performances at these buzzing junctions, pulsing with life and activity. After all, it’s wonderful to hear a ‘surily raag’ blend beautifully with the thumping ‘chug chug’ of a Mumbai local! 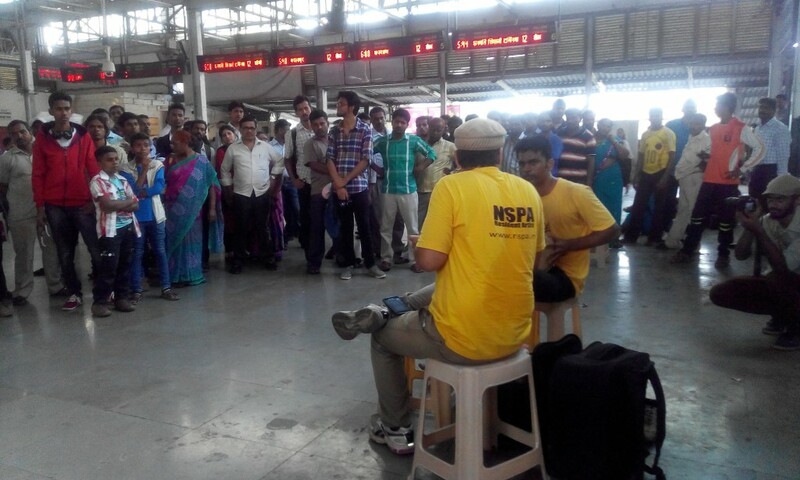 The Big NSPA Auditions – Talent, Music, Happiness! Fun Things to do this week! Rhythm By The Bay is Back! DIY of the Week – Easter Eggs 4 Ways! Copyright (c) 2017 Natural Streets for Performing Arts.